Take a magical Christmas holiday along the San Antonio Riverwalk and watch as four loves are inspired to grow amidst a vivid cultural backdrop. Against the backdrop of rich culture along the Riverwalk in San Antonio and the hopeful Christmas season, four romances are set aglow. Ecko and Sienna each finally meet their soul mates and start new adventures, while Valerie and Gabriela each reunite with old loves and learn to forgive the past. 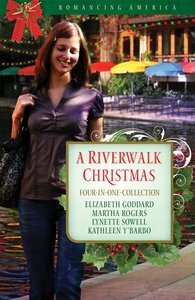 A vivid setting, rich in cultural history, Christmastime along the San Antonio Riverwalk is a delightful setting for four modern romances. Ecko finally meets the right kind of guy, but can he trust her motives? Valerie hires an old flame to revive her business, but will he stick around? Gabriela has a chance to forgive and find love, but can she? Sienna’s job brings her the chance of a lifetime, but will her rowdy family spoil it? About "A 4in1: Romancing America: River Walk Christmas (Romancing America Series)"
Lynette Sowell, a medical transcriptionist, combine their writing creativity with Rachel Hauck, a youth worker from Florida. Customer Reviews For "A 4in1: Romancing America: River Walk Christmas (Romancing America Series)"
These are four wonderful novellas to put you in the mood for Christmas and read to escape the busyness of the season for a few hours. I loved the characters in each of the stories but the Christmas mood, emphasis on traditions, family and the descriptions of how the town is decorated is what I really enjoyed. Joyful reading time.